Ilan Rubin knows the road better than most people know their hometown. The majority of his life has been decorated with countless shows, multiple continents and lapping The U.S. too many times to count. Following his own vision in the form of The New Regime, he still wants more. “We’re playing for a lot of different audiences and fans of diverse types of music. It’s all over the place, which is really great and what’s also interesting about that is there are quite a few cities we’ve been to five, six times in the past year. But because we’re always playing with a different audience each time, it’s almost as if we’re hitting these cities for the first time every show,” said creator of The New Regime, Ilan Rubin. 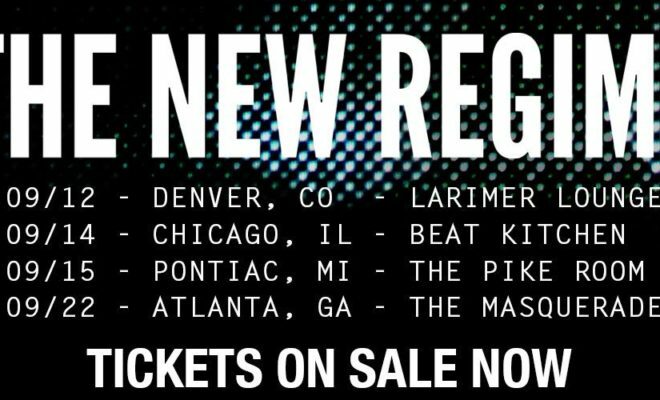 Whether with stunner, Juliette Lewis, bringing 2006 back with The Used or playing their biggest shows to date with Muse, The New Regime has played to your city, your friends and is coming back to play for you. For those who have yet to see Rubin’s completely independent and self created sound, fall brings plenty of opportunities to get personal. While booking headlining shows in Denver, Chicago, Pontiac and Atlanta, the group will then head out to meet up with The Cult in September and join Alice In Chains in October. While excited to be joining familiar faces deeper into fall, the headlining and more intimate sets are a great way to see The New Regime in an organic light. With local bands accompanying their upcoming shows and the possibility of adding more elements, these four headlining dates are can’t miss. “What’s cool about doing your own shows is that the people, who are there, are there to see you. You put on the show that you want to put on. It’s more about the songs I feel represent the band the best and creating the vibe I want to put out for each performance. You take the crowd on the journey that you want to with the music. So I’m looking forward to that,” said Rubin. When it comes to The New Regime, Rubin is the sole architect of every single sound. Every song is one hundred percent his own voice, execution and direction. There isn’t an instrument, creative role or production capacity he can’t play. “We’ve been rehearsing some stuff that’s a little more on the electronic side and some of the stuff is piano based which I think will add a very different element to the shows. We’ll be able to draw out the arc of the show we would like to without having to worry about how to fit in with other bands. It’s no longer about fitting in, it’s about putting across what you want, showing the music the way you intended,” said Rubin. Looking forward to these shows, a packed fall and the possibilities the end of 2016 and beginning of the next year hold, the obvious next step for The New Regime is finding a home. “Everything is completely independent and done by myself and Aaron, who manages me and records everything. So that’s what we’re trying to do this year, find that home so that the next release that comes out gets a proper release. That being said, use that as the proper springboard to continue to progress into the next year,” said Rubin. Whether in a green room, hotel or anywhere he finds a spare moment, Rubin most likely has an instrument in hand or is noting inspiration in anyway he can. The innate and undying drive to create is part of what makes him an extremely sought after and respected artist in his own right and now with his own band. While not every idea makes the cut, believe the tracks that do are meticulously worked through, transformed and brought up to a very tough personal standard. “The writing and the recording is going well. I don’t have any plans for a release yet. I always feel the need to be as productive as I can be so when I don’t have tour dates, the only other thing I do that makes sense is write music. That’s the only way I feel okay about not being on the road. Thanksgiving and on, in that time I’ll probably record a lot of music, and have enough to put out in the following year,” said Rubin. All upcoming tour information, tickets and dates can be found here. ← Previous Story Green Day Announce North American Club and European Arena Tour Dates!